A very special weekend deserves very special offer. 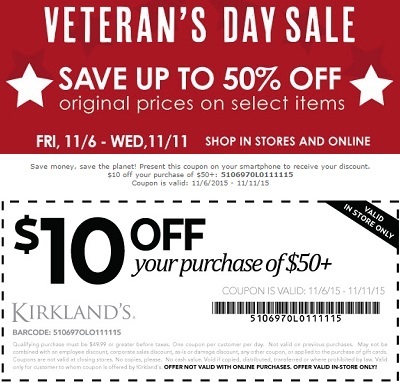 Veteran's Day Sale 2015 is on at Kirkland's stores in the U.S. and online. Save up to 50% off original retail prices on selected items. Plus, take an extra $10 off your in-store purchase of $50+. Coupon must be printed to receive the offer. Online use promo code SALUTE20 in cart and take $20 off your online order of $100 or more. Source of the information is Kirkland's. Offer expires 11/11/2015. More details available at Kirkland's stores and online.